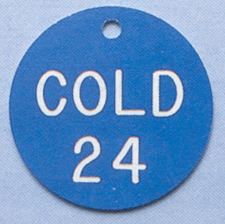 Brass is uniquely suited for situations where corrosion or high humidity might be unsuitable for other tag material. Some prefer it for its extraordinary durability. We provide brass disks in several sizes, engraved to your specifications with fast turn-around time and in quantities of one piece or a thousand. If you don't see exactly what you need, let us know as we have access to some additional sizes that are not normally in our stock. We'll still be able to provide prompt delivery and low cost! 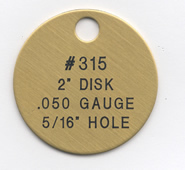 If you need to mark your piping or other assets with a hanging tag but don't want the expense of brass disks, please consider our 1/8" thick engraved Gravoply™ disks.